Aside from being home to the world’s fourth largest fountain, Fountain Hills has many other great attractions as well. Visitors and residents enjoy visiting the annual festivals to relax and meet up. As elsewhere in Arizona, people in Fountain Hills enjoy outdoor activities. Biking and hiking on trails, playing golf, jet-skiing on one of many of the Arizona lakes are just a few fun activities to partake in when you live in Fountain Hills. At the end of the day, you need a place to put your bike, golf clubs, tools and other items that are usually stored in Fountain Hills’ garages. In order to give every item the space it deserves, you need garage cabinets that help you to organize your garage while making it look tidy and sleek. 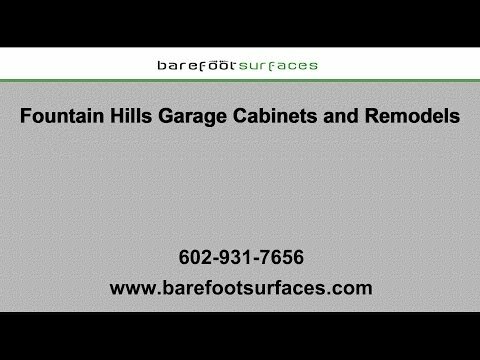 Barefoot Surfaces is your experienced Fountain Hills garage remodeling expert. Read on to learn about our garage remodel options and the great cabinets we have available to you. Ric Ramirez and his team at Barefoot Surfaces have over 20 years of experience in the garage remodeling industry. We understand that you need affordable solutions that work. We strive to turn your garage in a useful space that looks great and makes organizing your belongings a breeze. With a Fountain Hills garage remodel, we can do exactly that. We will sit down with you to figure out the best course of action and to fully understand what your needs are and what you are looking for in terms of style and organization. If you want to provide quality service, you have to work with quality materials. Barefoot Surfaces is an authorized dealer of Slide-Lok garage cabinets. These attractive and extremely durable storage cabinets will transform your garage into the space you have always hoped it would be. You can choose from the Tech or Classic series, or customize your cabinets with shelves, drawers and more. We guarantee these cabinets will last. Slide-Lok only uses sturdy plywood and never particle board. The days of stumbling over tricycles and roller-skates are over. Let Barefoot Surfaces help you to create attractive storage space with a Fountain Hills garage remodel and cabinet installation. We will take our time to get to know you and to figure out which cabinets and what style best suits your needs. You gain a garage that is organized and where you will never have to search for that certain hammer again. Also, cabinets protect your personal items from pests and unauthorized access. If you are tired of a garage that is useless and full of clutter, call Barefoot Surfaces today at 602-931-7656 or email Ric at Ric@barefootsurfaces.com. We can give your garage storage solutions that work and look great. And we only use the best products, such as Slide-Lok cabinets. Also ask us about our Fountain Hills concrete garage floor coating options. If you want garage floors that last longer and look better, we have a variety of floor coating options that can help. Don’t let your garage be the forgotten part of your home, after all- it is part of your home, too.